August 2014 ~ The Blawg, Y'all. I wanted to share our Wednesday work in progress, our Clemson pallet sign that will go in our office. I cannot believe August is almost over and that football season is starting tomorrow! Wow that went by fast, but I can't wait to start cheering our Tigers. Andrew (kindly, patiently) tore the slats from the pallet and I (not so graciously) tore away the remaining staples. Andrew placed the slats together in a row and screwed them in place. I stained the wood with two coats and let it sit overnight. Andrew painted the amazing blue ridge mountains and helped "grid out" the words for me- which come from our alma mater. I still need to go over the words one more time and then apply the sealant, and I can't wait for the finished product! Love fun little projects like this. And I can't wait to be back in this place in less than two weeks! The dog days of summer. How wonderful you have been. 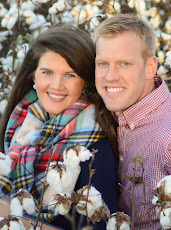 As we are traveling to four weddings this fall, and attempting to make it to more than one Clemson game this season, we decided to lay back these past few months. We managed to sneak away to see some family and friends in July, but other than that, we have been soaking up the sweetness (and humidity) of our little town. It has been good for the wallets and for the soul. We have been keeping our schedule of morning and late evening walks to escape the heat and stretch our legs. I could cry watching this special surprise unfold. I found it from a local shop/gem (handmade buck knife that I was too scared to hold to take a good picture of. SHARP SHARP Bear Grylls style. with homemade leather holster sniffffffffff). I loved the lunch break, back roads adventure that ensued from going pick up this said surprise. I'm discovering more of the little hideaways that the people here cherish and recommend ten times over. We've enjoyed date night in with some "fancies" Andrew picked up for me at Whole Foods on one of his out-of-town flights. Married peeps, have you established a weekly date night? I would strongly advise (since you know, I've been married half a minute and am so wise). I loved this fun, simple dinner party with friends, where we laughed and drank champagne and celebrated a sweet couple getting to move to Seattle. I want to visit them already. Of course it was dinner party turned karaoke hour. We've been kept safe from intruders by our fervent watch dog. And are thankful that thunderstorms don't cause any threats...as we would be out of luck I think. I also think I love our neighborhood a little more each day. Honestly, you pray for God to give you community and watch it come in ten-fold. My my. We found a new Thai place in town (watch outtttt nowww). They grow their basil in the front "yard" and have a kind staff. What fun date nights. And as always, we have been eating WELL the nights we stay home. What "little" memories are making you happy today? Thankful for this slow and sweet season of life! I came across this bench on pinterest (of course) and asked Andrew if we could build it together. He built the headboard for our bed last year, and since we didn't have a footboard or anything at the end of the bed, I thought a bench would be a nice addition. This one is shorter than the one in the tutorial so that it would fit our space. It did only cost about $15, since we already had the stain on-hand from the headboard and our dining room table. I showed it to him on a Friday night, and to my excitement, he was up that Saturday measuring and taking the truck to Lowes. That guy. The best! The image below is picture of the headboard. I am unable to take a picture of the bench and headboard together..but you get the idea. ;) I just love that we are able to "have" this bed from Pottery Barn for less than $50. (our bed spread is from there and cost more than the bed frame itself). Please excuse the picture's quality as I took it at night in the middle of taking down the pillows ("oh I need to take a picture!" *throws pillows back on top real quick*) The front pillow is more burnt red than the lovely coral it seems to be in the picture. I have several of these great pillows from Belk. I am so excited about the finished project. I love the mix of rustic-yet-feminine. I also adore the price and that it is so cozzyyyyy. Have you had any fun projects lately? 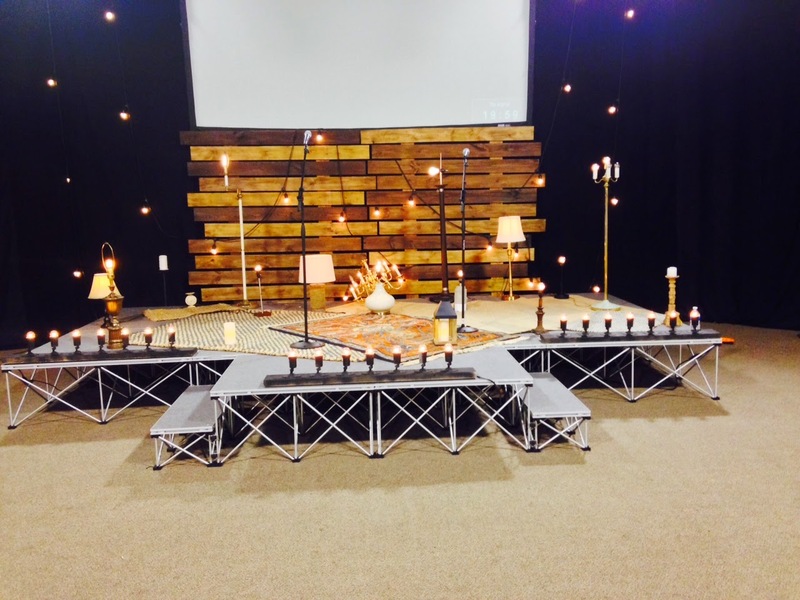 Our church started a third worship service on Sunday mornings. Due to the crowd at the 10:30 hour, an overflow room has been used for awhile now. Our awesome friends on church staff decided to take the "overflow room" and create an intentional worship space with its own service. AC and I loved the idea of this laid-back, more intimate experience and asked what we could do to help. We help set up for it during the week and I was overwhelmed with how awesome it looked when I walked in Sunday morning! We had to add extra seats and I got to meet a handful of new people while working the coffee (cafe femenino, to be exact) cart (one of my favorite things on Sundays). This one is part of the band. Love his dedication to practice even after 10+ hour work days. He does everything in excellence and watching him do so is an inspiration. After church, we celebrated the "successful launch" with friends over brunch at Restaurant Tyler. BLT benedict and cheese grits. Amen! So grateful for our church. So grateful to work alongside some amazingly talented friends who love Jesus! It is so much fun. There is a little room off our kitchen that has been quite bare for well...a year. I'm guessing it was a breakfast nook before we moved in, but we didn't really need the space for another place to eat (we have a kitchen island and our dining room already.. #firstworldproblems). We decided it would make a great space for reading. Over the past year, it has developed, and I would say its pretty much done at this point. It all started with the rug. Which we got from our local Dirt Cheap for $9. It is from the Target Threshold line. I searched all over for a reputable re-upholstery shop with no success. I thought of ordering a custom slip cover online, but I was a little nervous. Finally, I found an oversized, stretch slipcover from the company that made our couch slipcover (the couch actually goes with this chair. thank you sweet parents). I was comfortable ordering from this company due to the great success we have had with the one on our couch (no constant tucking and pulling woo!). I went back to Dirt Cheap with a friend on the hunt for a side table and a lamp shade to "complete" the space. Dirt Cheap is basically a salvage store with lots and lots of (unused) Target goodies. It's like the Target heavens showed some mercy on us living in exile by providing us us their discarded pieces for 50-90% off retail. The side table drawer needed a little TLC..and that's where this guy comes in to save the day (as always!). Free chair, free lamp, $3 shade, $4 oversized pillow, $9 rug, 50cents thrift store basket spray painted gold, $60 slipcover (SureFit stretch from overstock.com), and $20 side table...boom! The wall to the right has a bookshelf with our coffee "station" on top. Our prayer board is attached to the wall. ...and the hound is back in the appropriate place (after some discipline :/). I'm so happy with this space! It's been the perfect place for iced coffee and a good book before or after work! Do you have any fun projects going on at your house? 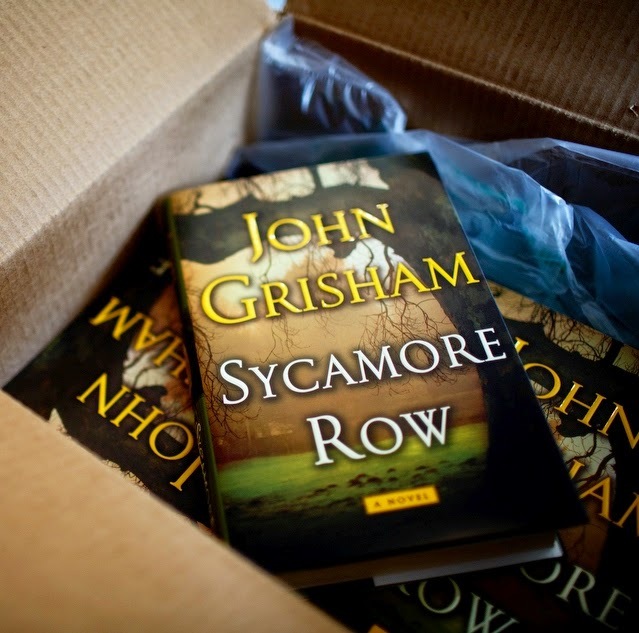 Last week, we finished the audio book of Sycamore Row by John Grisham. We had a free download from the audible app and thought it would be fun to listen to it and help pass the time during our road trip to the Carolinas. The book was 20 hours...and we finished 17 of those hours during our travels! Wowza. The rest we finished during our nightly after-dinner walks. I of course love John Grisham, and I really loved this book (Andrew did, too). Sycamore Row is a sequel to the famous A Time to Kill. Set in the same town of "Clanton", Mississippi in the late 1980's, Sycamore Row tells the story of a Mr. Seth Hubbard, a local millionaire who writes a holographic will, sends the will to attorney Jake Brigance, asks Jake to handle his estate... and then commits suicide. The book chronicles Brigance's life after the famous Haley trial while uncovering more of the long-running social and racial tensions in the deep south. It paints an exciting story from beginning 'til the very end. I always love how Grisham develops his characters. It would be great if he would make the tales of Jake Brigance, Lucien Wilbanks, and Harry Rex Vonner in to a nice, long series. 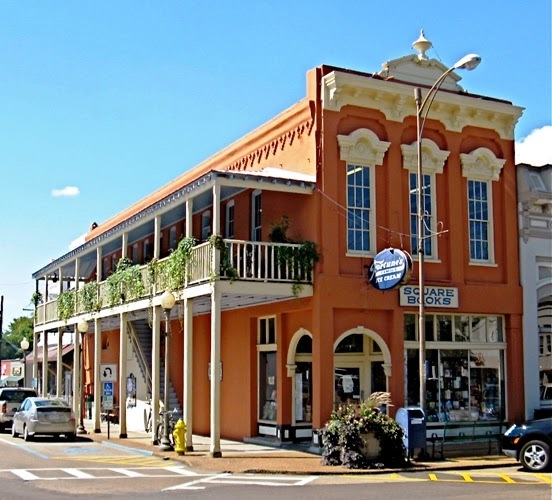 ;) I also loved that, now that I live in Mississippi, I can actually picture the places and the people he describes- the slow pace of life, the culture of the people, the rich history, and the fun architecture- he describes it all so, so well. This was a great summer read..or a read for any time really. I am so excited to read his newest, Gray Mountain when it comes out this fall. I can't wait to see his depiction of a young associate in NYC who moves to a small mountain town to work for legal aid...oh yea! Do you have a favorite Grisham novel? See more book recommendations here- and join me in reading more in 2014!